Do your beginning students usually progress slowly? Do some of your beginner students lose interest in lessons and stop studying with you after less than 1 year? Is it sometimes difficult for you to keep your guitar students motivated to practice? If you answered "Yes", you are not alone. Many guitar teachers have these same problems with their beginner students. can make learning guitar easy and fun for them. Good news is that teaching beginner students is not very hard after you learn 5 mistakes that most guitar teachers make and understand how to avoid them. When you learn to teach beginners the right way, you will always have a full schedule of guitar students and will make a lot more money teaching guitar. The linear approach to teaching guitar means your students work on one skill at a time and wait until they fully master it before you teach them the next skill. This approach is logical... the problem is that it only works well when you are teaching a linear topic (such as mathematics or science) or if you are programming a computer. The linear approach doesn’t work well when teaching music to people (especially beginners). When your students learn one thing at a time, they don’t feel like musicians when they practice guitar. The learning process becomes boring and seems to take forever. Most beginners get discouraged quickly and lose interest in playing guitar before they see real progress (more on this below). Guitar students improve a much faster when you teach them using the Geometric ApproachTM. With the geometric guitar teaching method, your students improve in several areas of their guitar playing at the same time. Most importantly, they get to feel like real musicians even before their skills reach an advanced level. Want to know how good you are at teaching beginning guitar students? Take this short guitar teaching quiz to learn how to help your students become amazing musicians and become the #1 guitar teacher in your area. When you started playing guitar (as a complete beginner), you probably wanted to have fun, play the music you love and be admired by others, right? Your beginner guitar students are the same way. They take guitar lessons from you to learn guitar faster and have more fun in the process. Playing finger exercises, learning to read music or studying music theory is the very opposite of fun to most beginners. Worst of all, beginners cannot do anything musical with finger exercises or with sight reading skills. When your students don’t have fun, they quickly lose interest in taking lessons. Solution: get your students playing music as soon as possible (ideally right in the first lesson). Show your beginner students that playing guitar is even more fun than they hoped it would be. This makes them excited to continue practicing and take lessons from you. Read this article to learn 10 simple guitar teaching tips that help you make your guitar lessons fun and effective for your students. Note: finger exercises, music theory and ear training ARE very useful for most students to know and practice (especially music theory and ear training), but not when they are beginners. Learn how to get great results for your beginner guitar students. to start teaching guitar right away. and grow your teaching business. Do your best to remove these self-doubts from your students’ minds as soon as possible. Show your students that they have as much potential as their favorite guitar players. This helps your students develop self-confidence and persevere through the learning process. Your beginner students have totally different challenges, mindsets and reasons for taking guitar lessons than intermediate or advanced guitar students. They cannot practice guitar with the same intensity and persistence as more advanced guitarists can. Example: Advanced students are more likely to practice a tedious exercise countless times to improve some aspect of their playing. They are very clear on what they want to achieve and are less likely to get bored or overwhelmed. Most beginners cannot (or will not) fully commit to this style of practicing yet. Solution: Give your beginner students easy victories. Let them experience some progress in each lesson they have with you. This makes your students more willing to practice what you tell them to practice. Eventually, they will trust you (and themselves) enough to practice tedious exercises for long periods of time, just like your intermediate and advanced students do. If you expect your guitar students to pay you money for lessons, your students deserve for you to be the best teacher you can possibly be. When all your guitar teaching experience comes from trial and error, your guitar students become like laboratory rats in an experiment. Of course you can learn some good things from hands-on teaching, but it’s unfair to your students when you learn only in this way. With all of the resources available for guitar teachers today, there is no excuse for you to not be the best guitar teacher you can be. 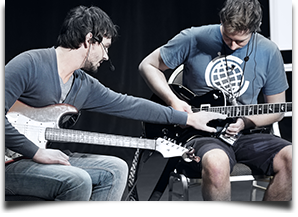 Seek out proven training programs for guitar teachers, acquire guitar teaching resources, or at least read more articles (like this one) on how to become a better guitar teacher. Now that you know what mistakes to avoid with your beginner guitar students, the next step to becoming a very successful guitar teacher is to test your guitar teaching skills. 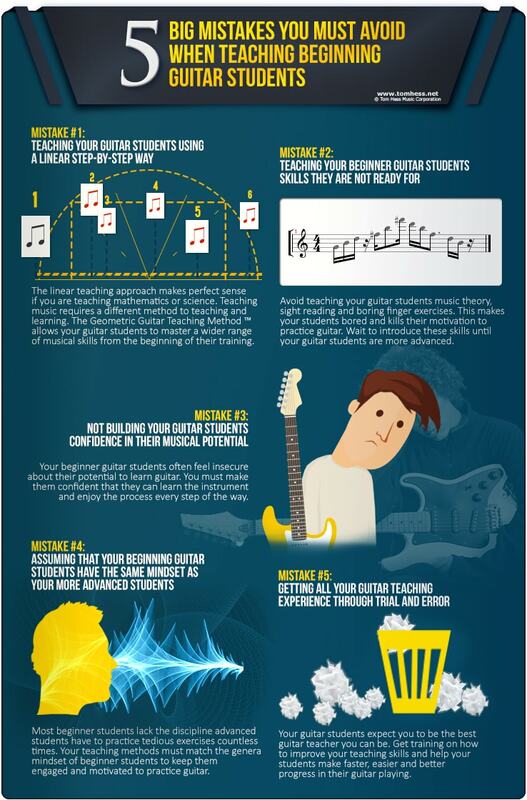 This tells you exactly what to do to become the kind of guitar teacher every student brags about. Take this guitar teaching quiz to learn how to become a better guitar teacher right now. Improve your guitar teaching skills by learning how to teach guitar to beginners.